By Anthony Crupi . Published on January 15, 2019. According to Nielsen live-plus-same-day data, the four Wild Card and four Divisional Round broadcasts averaged 30.4 million viewers and a 17.2 household rating, which works out to a 10 percent improvement compared to last year's analogous games. Seven of the eight postseason showdowns put up higher numbers than their year-ago counterparts, with only CBS's coverage of the Chargers-Patriots blowout failing to deliver a larger audience than the comparable game in 2018. The biggest draw of the two early rounds came courtesy of Fox's coverage of Sunday evening's hotly contested Eagles-Saints matchup, which averaged 38.2 million viewers and a 20.9 rating, up 8 percent compared to last year's Saints-Vikings window. 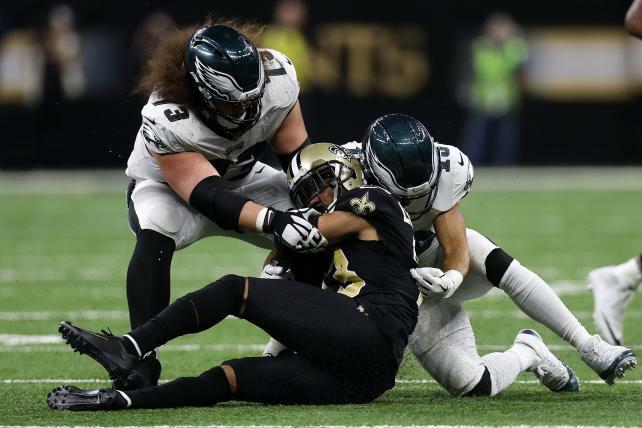 Philadelphia's hopes of defending its title evaporated with 2:01 left on the clock when a Nick Foles pass sailed through receiver Alshon Jeffery's hands and was picked off on the Saints' 19-yard-line. Sunday's late Divisional Round broadcast gives Fox bragging rights to four of the season's top five most-watched broadcasts, a roster that includes its three playoff games and the Washington-Dallas grudge match on Thanksgiving Day. NBC can lay claim to the season's second-largest NFL audience thus far, as 35.9 million viewers tuned in for its presentation of the late Sunday Wild Card brawl between the Eagles and Bears. As much as the ratings gains are welcoming after last season's unusually iffy TV turnout, the deliveries remain somewhat underwhelming when compared to the results of recent years. For example, in 2016 no fewer than four of the early-round playoff games scared up a rating of 20.0 or better; this time around, only one contest hit the mark. For all that, it's impossible to overstate how comparably huge the NFL ratings are when juxtaposed with pretty much everything else on the TV dial. For example, on the Sunday of Wild Card weekend, after the two playoff games on CBS and NBC averaged 30.7 million viewers and a 17.6 rating, the seven first-run scripted shows that aired in primetime scraped by with an average 4.05 million viewers and a 2.5 rating. The Golden Globes, which was broadcast the same night by NBC, drew a little more than half the earlier NFL audience. Naturally, marketing dollars have followed the eyeballs—per iSpot.tv estimates, ads in the eight playoff games have delivered some 21.2 billion impressions. Among the top spenders are the usual gang of wireless, insurance and automotive brands, a collection that includes Verizon, Ford, Geico, Progressive, AT&T, Chevrolet, Apple, State Farm, Bud Light and Hyundai. Advertisers buying time in Sunday's games are investing as much as $3.2 million for each 30-second slice of in-game inventory. Looking ahead to Championship Sunday, Fox and CBS should benefit from intriguing matchups between two old guard quarterbacks and a pair of phenoms who are still in their early 20s. Fox's NFC Championship game will feature the No. 2 scoring offense in Jared Goff and the Rams and the No. 3 squad in Drew Brees and the Saints. Together, the two QBs threw for 64 regular-season passing touchdowns while generating more offensive points than anyone this side of Kansas City's Patrick Mahomes. Vegas books are eying a close game, establishing New Orleans as a 3.5-point favorite at home. Super Bowl LIII host CBS gets the late Sunday game, with the AFC title tilt between the dizzyingly prolific Mahomes (50 touchdown tosses on the year) and the universally-acknowledged G.O.A.T., Tom Brady. This game is the sequel to the bonkers Oct. 14 Chiefs-Pats air war, which New England salvaged with a last-second field goal after having blown a 15-point halftime lead. Home-field advantage and Mahomes' otherworldly howitzer make the Chiefs a 3-point favorite. In New England and Kansas City, the CBS broadcast will spotlight the NFL's No. 3 and No. 10 most-watched franchises. But for the absence of Pittsburgh, which failed to secure a playoff spot, this is the best-case scenario for the AFC, which is a lesser draw than the NFC. Fox, meanwhile, has two reliable draws in No. 7 New Orleans and No. 8 L.A., a mash-up of one of the nation's most football-crazed markets with the second largest in terms of TV ownership. In order to keep the ratings momentum going, the networks will be charged with surpassing last year's less-than-stellar deliveries. With an average draw of 44.1 million viewers and a 24.3 rating, the Pats-Jaguars heartbreaker was the least-watched, lowest-rated AFC Championship in five years. In the late window, the Vikings-Eagles blowout was the lowest-rated NFC Championship since 2006. The bar is set pretty low. Rams-Saints kicks off at 3:05 p.m. EST on Fox. Pats-Chiefs is slated to begin at 6:40 p.m. EST on CBS.